In the past 30 years there have been major improvements in the care of children with chronic kidney disease (CKD). However, most of the available epidemiological data stem from end-stage renal disease (ESRD) registries and information on the earlier stages of pediatric CKD is still limited. The median reported incidence of renal replacement therapy (RRT) in children aged 0–19 years across the world in 2008 was 9 per million of the age-related population (4–18 years). The prevalence of RRT in 2008 ranged from 18 to 100 per million of the age-related population. Congenital disorders, including congenital anomalies of the kidney and urinary tract (CAKUT) and hereditary nephropathies, are responsible for about two thirds of all cases of CKD in developed countries, while acquired causes predominate in developing countries. Children with congenital disorders experience a slower progression of CKD than those with glomerulonephritis, resulting in a lower proportion of CAKUT in the ESRD population compared with less advanced stages of CKD. Most children with ESRD start on dialysis and then receive a transplant. While the survival rate of children with ERSD has improved, it remains about 30 times lower than that of healthy peers. Children now mainly die of cardiovascular causes and infection rather than from renal failure. An erratum to this article can be found at http://dx.doi.org/10.1007/s00467-011-1979-6. Chronic kidney disease (CKD) refers to a condition related to irreversible kidney damage that can further progress to end-stage renal disease (ESRD). CKD is a major public health problem worldwide and extensive epidemiological research in the adult population is available. In contrast, little is known about the epidemiology of CKD in the pediatric population. ESRD is a devastating disorder associated with excessive mortality and cardiovascular morbidity, and specific problems occur in children, such as impaired growth and psychosocial adjustment, all of which severely impact upon the quality of life [1, 2, 3]. A better understanding of the epidemiology of CKD in children is essential in order to make a precise and early diagnosis, identify preventable or reversible causes of progression, predict prognosis, and aid the counseling of the children and their families. A possible reason for the limited information on the epidemiology of CKD in the pediatric population is the historical absence of a common definition and well-defined classification of CKD. In 2002, the National Kidney Foundation’s Kidney Disease Outcomes Quality Initiative (NKF-K/DOQI) published a guideline on CKD, which included a classification system for CKD severity, independent of cause, and applicable to children . Prior to the introduction of this classification, various thresholds were used. For example, the ItalKid Project, a prospective, population-based Italian study on CKD epidemiology, and the North American Pediatric Renal Trials and Collaborative Studies (NAPRTCS), defined CKD as having a glomerular filtration rate (GFR) of below 75 ml/min/1.73 m2 [5, 6]. Others based their definition on serum creatinine levels themselves or on other thresholds of GFR [7, 8, 9]. The K/DOQI classification system identifies five stages of CKD based on the level of GFR. CKD is now defined by a presence of kidney damage (for example, any structural or functional abnormality involving pathological, laboratory or imaging findings) for ≥ 3 months or a GFR < 60 ml/min/1.73 m2 for ≥ 3 months. The new classification was widely adopted after its introduction; however, its limitations and possible modifications have been a matter of extensive discussion . In children, the currently available methods of estimating GFR are evolving, but a proper assessment of renal function by estimated GFR formulae remains challenging, particularly in the early stages of kidney injury . For example, the K/DOQI classification does not apply to children under 2 years of age as GFR increases from birth and reaches normal adult values by 2 years of age . Furthermore, children born with major structural anomalies will be considered to have CKD before waiting 3 months for such a diagnosis. Causes of CKD are very different in children from those in adults. In the United States, the registry of the NAPRTCS has collected data on the early stages of CKD in children since 1994 . The NAPRTCS Registry receives data from pediatric nephrology centers on a voluntary basis and includes more than 7,000 children aged under 21 years, providing a large source of information on the etiology of CKD in childhood . In a recent NAPRTCS report congenital causes, including congenital anomalies of the kidney and urinary tract (CAKUT) (48%) and hereditary nephropathies (10%), were the most common (Table 1). Glomerulonephritis accounted for 14% of cases. The distribution of causes varied with age. Whereas CAKUT predominated in younger patients, glomerulonephritis was the leading cause in children older than 12 years of age. Causes of CKD vary across races, for example, focal segmental glomerulosclerosis, the main cause of glomerular disease, was three times more common in blacks than in whites (19 vs 6%) and especially among black adolescents (35%) . A fairly similar distribution of causes of CKD has been reported in Europe by the Italian and the Belgian registries [5, 13]. The proportions of CAKUT (58–59%) and hereditary nephropathy (15–19%) were slightly higher, while the proportion of glomerulonephritis was lower (5–7%) than in the NAPRTCS database, possibly because of the difference in racial distribution. In view of a dearth of national registries and surveys, estimating the causes of CKD in children in low and middle income countries is difficult. In Turkey and other countries in the Middle East, CAKUT is the leading cause of CKD (47–62%) with a clear predominance of uropathies over hypodysplasia followed by hereditary nephropathies (17 to 30%) [9, 14, 15, 16]. Of note, neuropathic bladder remained an important cause of CKD in Turkey (15%), while it accounted for about 4% in Italy and Belgium. These figures may reflect a delay in appropriate urological diagnosis and treatment. In addition, the higher proportion of genetic diseases found in the Middle East than in Europe may be explained by a higher prevalence of consanguineous marriages. Chronic glomerulonephritis is the main reported cause of CKD in various studies from India, Southeast Asia, Latin America and Caribbean area and sub-Saharan Africa, with a prevalence ranging from 30 to almost 60% [17, 18, 19, 20, 21, 22, 23, 24, 25]. Such high proportions of glomerulonephritis may be related to high prevalence of bacterial, viral, and parasitic infections that commonly affect the kidneys in developing countries, as well as a different age distribution in these reports where patients are referred in the later stages of CKD. In the United States Renal Data System (URDS) Registry, congenital disorders (CAKUT and hereditary nephropathies) were the most common etiologies in the youngest ESRD group, whereas the proportion of acquired diseases increased progressively with age . Overall, CAKUT are the main causes, accounting for 34–43% of pediatric ESRD cases in Europe, Japan, Australia, and New Zealand (Table 1) [27, 28, 29, 30]. In 2008, the proportion of ESRD caused by glomerulonephritis was lower in Europe according to the ESPN/ERA-EDTA registry (15%) compared with a Japanese study (22%) and the Australia and New Zealand Dialysis and Transplant Registry (ANZDATA; 29%). The ANZDATA Registry showed a decline in glomerulonephritis as a cause of ESRD over time. However, this may be due to the age distribution of patients, with fewer young patients being treated for ESRD at that time. There was also a decline in the proportion of ESRD caused by reflux nephropathy, while obstructive uropathy and hypodysplasia increased . This trend may be explained by a change in reporting the primary diagnosis, since the combined proportion of hypodysplasia and reflux nephropathy has remained stable over the past 30 years. While screening and surveillance of CKD in adults, either population-based or targeted at-risk populations, have become important parts of CKD prevention strategies worldwide, the benefit of such programs in children is much more controversial . Tests used for CKD screening in children are usually limited to urinary dipstick protein instead of urine albumin/creatinine ratio or creatinine-based calculation of estimated GFR, as recommended for adults. However, there is a large variation in the methods used and approaches taken by different countries, and the findings have shown poor reproducibility (Table S1 and references in ESM). Mass screening programs to detect CKD in children have been well established for many years in several Asian countries, such as Japan, Taiwan, and Korea [33, 34, 35]. Conversely, screening programs have not been adopted in Europe, but urine screening dipsticks have routinely been used in healthy children for decades in the United States. In 2000, the recommendations from the American Academy of Pediatrics were to screen urine in two groups: preschool children and adolescents . This policy was revised in 2007; thus, this practice is no longer recommended . 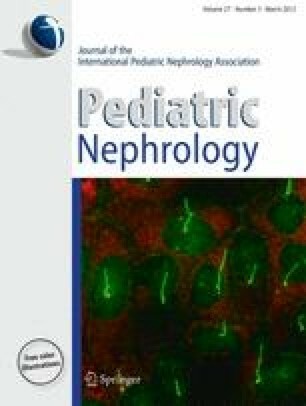 Although a decrease in the incidence of ESRD has been observed in Japan and Taiwan, there is only limited evidence that early detection of kidney injury in children may lead to effective interventions to slow the progression of CKD and to further reduce the risk of developing ESRD . Furthermore, recent studies suggest that a urine dipstick is not cost-effective in screening children . There is limited information on the epidemiology of the early stages of CKD in the pediatric population as it is often asymptomatic and therefore under-diagnosed and under-reported. Although some pediatric CKD registries using K/DOQI classification are beginning to emerge, only a few reports on the epidemiology of CKD stages 2 to 5 in children are available, and even less is known about low-income countries. For these countries, data is mostly obtained from reports of major tertiary care referral centers, but the validity of this data is variable. Several pediatric nephrology societies from European countries have provided data on the early stages of CKD (Table 2) [5, 7, 8, 13, 14, 39]. Even though age categories and the definition of CKD differed among countries, the incidence in Europe was fairly consistent, being around 11–12 per million of the age-related population (pmarp) for CKD stages 3–5, and 8 pmarp for CKD stages 4–5. While an increase in incidence since the 1970s was seen in France, this was not shown in Sweden [8, 40]. Prevalence ranged from about 55–60 to 70–75 pmarp in Spain and Italy, depending on the clinical definition of CKD that was used in each study. Another consistent finding was the predominance of the male gender (male/female ratio ranging from 1.3 to 2.0) reflecting in particular the higher incidence of CAKUT in boys than in girls. In Chile, a national survey of pediatric nephrologists estimated an incidence of CKD (GFR < 30 ml/min/1.73 m2) in children aged less than 18 years of 5.7 pmarp and a prevalence of 42.5 pmarp in 1996 . Among these patients, half were on conservative treatment and the others were on renal replacement therapy (RRT). A study on the epidemiology of CKD conducted in several Latin American countries (Argentina, Brazil, Chile, Colombia, Mexico, Uruguay, and Venezuela) showed a wide variation in incidence that ranged from 2.8 to 15.8 new cases pmarp . The referral center for pediatric kidney diseases in Kuwait provided data on children aged 0–15 years with a GFR < 50 ml/min/1.73 m2 . The mean incidence was found to be as high as 38 pmarp, whereas the prevalence increased from 188 in 1996 to a rate as high as 329 pmarp in 2003. The marked difference in incidence between Kuwaiti children and non-Kuwaiti residents suggested a role of genetic factors . An incidence of 11 pmarp and a prevalence of 51 pmarp have been reported in Jordanian children . Two reports from Vietnam have suggested an annual incidence of hospitalization for CKD of around 5 pmarp, and most of the patients had already reached ESRD [19, 20]. Single-center studies from sub-Saharan Africa have shown a very low incidence of CKD, estimated at 3 pmarp in Nigeria, which did not offer pediatric RRT, and 1–2 pmarp in South Africa [23, 24]. There are marked variations in the incidence and prevalence of ESRD in the pediatric population across countries. Approximately 80% of RRT patients worldwide live in Europe, Japan or North America, where all children with ESRD have access to RRT. By contrast, limited health care resources and lack of trained personnel in developing countries result in rationing of or even not offering RRT. In 2008, the median incidence of RRT in children aged less than 20 years was around 9 pmarp, varying from less than 4 (Russia) to 18 pmarp (New Zealand; Fig. 1). The incidence of RRT was 9.5 pmarp among 11 western European countries and in Australia compared with 15.5 in the United States [26, 27, 43]. As a comparison, the incidence of RRT in adults varied from around 100–150 in Europe and Australia to 300–350 in Japan and the United States in 2008 . In every registry, a higher incidence was found in adolescents. The incidence was twice as high in the United States as in western Europe in the 15- to 19-year age group (30.6 vs 15.3) and was also higher in the 0- to 14-year age group (10.5 vs 6.5 in western Europe). This difference might be partly explained by the timing of initiation of RRT. Indeed, RRT was started at a median GFR of 10.4 ml/min/1.73 m2 in European children, whereas mean GFR ranged from 11.3 to 13.6 ml/min/1.73 m2 in the United States [44, 45]. In Japan, the incidence of pediatric RRT (4.3 pmarp) was much lower than in other high-income countries (Dr Hattori, personal communication, used with permisson), even though Japan has one of the highest incidence rates of ESRD in adults. The incidence in Malaysia was comparable to that of Europe, suggesting good access to RRT in this country, which has a publically funded dialysis program . In previous reports from countries offering RRT, incidence rates of RRT varied from 6.5 pmarp in Brazil in the late 1980s to 17 pmarp in Kuwait in the period 1995–2002 [47, 48]. In developing countries where RRT is unaffordable for all but the very wealthy, incidence rates are extremely low (< 1 pmarp in Bangladesh and Nepal). The prevalence of children with RRT in 2008 was around 65 pmarp in Australia, Canada, Malaysia, and western Europe, with the exception of Finland where a high incidence of ESRD in infants due to congenital nephrotic syndrome of the Finnish type led to a greater prevalence of RRT (Fig. 2). The prevalence was higher in the United States (85 pmarp), whilst Japan had a lower prevalence (34 pmarp). A recent survey conducted in the most populated Brazilian State showed a prevalence of 23 pmarp in children less than 18 years of age (Dr Koch Nogueira, personal communication, used with permisson). Incidence and prevalence also differ by race. African–American children had an almost two-fold greater incidence of ESRD compared with white children , while in Australia and New Zealand, kidney disease is more common in Maori, Pacific Island, and indigenous Australian people than in non-indigenous people, although the difference in incidence of ESRD is mainly among those over the age of 15 years . In the UK, the prevalence and the incidence of RRT in children from the south Asian population in 2008 were 2.5 and 1.5 times greater than that of the white population aged 0–15 years . In the United States, the adjusted annual incidence of ESRD in the pediatric population rose slowly during the 1980s, and then increased marginally from 14 to 15 pmarp between 1990 and 2008 . The adjusted prevalence increased from 60 to 85 in the same period. The incidence of ESRD in children aged less than 18 years from Australia and New Zealand has remained constant at about 8 pmarp over the past 25 years, while the prevalence of RRT increased from approximately 30 to 50 pmarp . A report from the EDTA registry on patients aged 0–19 years starting RRT between 1980 and 2000 in 12 western European countries showed that the incidence of RRT rose from 7 pmarp in 1980–1984 to 10 pmarp in 1985–1989, and remained stable thereafter . The prevalence increased from 22.9 pmarp in 1980 to 62 pmarp in 2000. The increase in prevalence is explained by improved survival and treatment of younger children. Countries vary considerably in the distribution of initial treatment modality . Some countries, like Japan or Turkey, preferentially use peritoneal dialysis (PD) [27, 51], but in most registries about half of children younger than 20 years of age commenced RRT with hemodialysis (HD; Table 3). Initial RRT varies with age since PD is the preferred choice in children aged 0–14 years in Europe and the United States, whereas three-quarters of children aged 15–19 years start with HD [26, 43]. This may reflect the management of many adolescents in adult units where HD is more likely to be proposed than in pediatric units. Registry data have shown that 65–80% of children and adolescents on RRT programs have a kidney transplant (Table 3), with the exception of Japan where the transplantation rate was very low in data from 1998. In developing countries, dialysis is often not offered. Survival therefore depends on the development of locally appropriate transplant programs. The lack of deceased donors might lead to pressure on relatives to become living donors and a trade in paid organ donation. At the start of RRT programs in the 1960s, the case-fatality rate was 11.0 per 100 patient years . Since then, there has been much improvement, now showing a stable case-fatality rate of 1.3–1.8 per 100 patient years in the past 15 years [50, 52]. Survival is similar throughout the developed world [52, 53, 54], but still the mortality rate in children with RRT is about 30 times higher than in their healthy peers [52, 53]. Infants with severe renal disease are at higher risk of death in the first 2 years of life, but outcomes thereafter are comparable to those of older children . Transplant patients consistently have up to a 4-fold survival benefit compared with dialysis patients [45, 52]. Among young adults who started RRT during childhood, the average life expectancy was 63 years for those with a functioning graft compared with 38 years for those remaining on dialysis . Other risk factors for a higher mortality include the presence of co-morbidities, and long standing hypertension [52, 53]. The two major causes of mortality in pediatric RRT are cardiovascular disease and infections, accounting for 30–40% and 20–50% of deaths respectively [12, 45, 52, 53]. Also, the burden of morbidity from cardiovascular disease and infections is high, as, for example, infections caused 600 admissions per 1,000 patient years and cardiovascular disease 350 admissions per 1,000 patient years in the first month of starting dialysis, according to the most recent USRDS report . In transplant patients, infection has overtaken acute rejection as the primary cause of hospital admissions . The progression of CKD is variable and depends on the underlying disease, the severity of the initial injury, and the presence of additional risk factors. Data from the NAPRTCS on more than 4,000 children with CKD stages 2–4 showed a progression rate to ESRD of 17% at 1 year and 39% at 3 years following registration, with a median time to ESRD of 4.5 years . The rate of progression was inversely proportional to baseline GFR. In the ItalKid project, the incidence of RRT was 7.3 per year per 100 patients with CKD, and the risk of ESRD was 68% by the age of 20 years . Children with congenital disorders experience a slower progression of CKD than those with glomerulonephritis, resulting in a relatively decreased proportion of hypodysplasia and uropathies in the RRT population compared with less advanced stages of CKD. Also, the rate of progression of CKD is usually greater during puberty [5, 59]. Potential mechanisms include a higher blood pressure, imbalance between residual nephron mass and filtration demands during this period of rapid change in body size, as well as altered endocrine physiology. A low birth weight is associated with a lower number of nephrons, which might predispose to hypertension and CKD in later life . Although it has been clearly established that many ethnic minorities suffer a greater incidence of ESRD compared with whites [26, 29], the evidence to date does not show ethnic differences in the rates of progression of CKD in children. Possible confounders, such as unequal access to care, are difficult to assess. Finally, genetic predisposition may influence the rate of progression of CKD. Several recent genome-wide association studies have identified genetic loci that relate to CKD susceptibility and progression in adults . Hypertension and proteinuria are the most important independent risk factors for renal disease progression in both adult and pediatric CKD [62, 63, 64]. Hypertension is present in approximately 50% of children with CKD and masked hypertension (i.e., normal casual but elevated ambulatory blood pressure) is often present [65, 66]. The ESCAPE study group showed that strict blood pressure control under the 50th percentile slows pediatric CKD progression during 5 years’ follow-up . In the ESCAPE trial, the initial antiproteinuric response to angiotensin-converting enzyme inhibitor therapy was predictive of renal survival, despite the occurrence of a proteinuria rebound in half of the patients . There is clear evidence in adults that obesity is associated with an increased risk of development and progression of kidney disease . A similar association has also been documented in obese children, even though there is a lack of large and long-term follow-up studies . Other factors potentially involved in the progression of CKD have been addressed in adult patients, including metabolic acidosis, anemia, altered calcium-phosphate homeostasis, chronic inflammation, and metabolic factors, such as diabetes, hyperuricemia, dyslipidemia, and smoking [70, 71, 72, 73, 74, 75]. Pediatric retrospective data suggest that many factors such as anemia, hypoalbuminemia, hyperphosphatemia, and hypocalcemia might be associated with the rate of CKD progression, implying potential measures to preserve renal function [59, 76]. However, these data require confirmation from ongoing prospective cohort studies on pediatric CKD [77, 78]. Recent years have shown a tremendous increase in the amount of available data on CKD and ESRD in children. Nevertheless, there are still only limited data on the earlier stages of CKD. As numbers of patients are small, more research is needed to improve the understanding of the differences in incidence between countries, causes and progression of CKD in order to prevent renal failure, as well as improved quality of care among patients with ESRD. To allow for international comparisons in future studies, we recommend using the K/DOQI guidelines to define the stages of CKD and publishing data for similar age groups (by showing separate data for children aged 0–14 years and what is available above 15 years of age). We gratefully acknowledge Dr Motoshi Hattori (Japanese Society for Pediatric Nephrology, Tokyo Women’s Medical University, Japan), Dr Rajani Hada (Bir Hospital, Kathmandu, Nepal), Dr Chiu-Ching Huang (Taiwan Renal Registry, China Medical University Hospital, Taiwan), Dr Paulo Koch Nogueira (Universidade Federal de São Paulo, Brazil), Dr Randall Lou-Meda (FUNDANIER, Hospital Roosevelt, Guatemala City, Guatemala), Dr Steven McTaggart (ANZDATA Registry, Royal Children's Hospital, Brisbane, Australia), Dr Elena Molchanova (Russian Pediatric Registry of RRT, Russian Children Clinical Hospital, Moscow, Russia), Dr Nelson Orta-Sibu (ALANEPE Latin American Pediatric Nephrology Association, Hospital Universitario de Valencia, Venezuela) for providing epidemiological data. Jérôme Harambat was supported by an ERA-EDTA QUEST initiative research fund. Which of the following statements regarding CKD is false? Which of the following statements regarding screening in children is true? Which of the following statements regarding ESRD is false? Which of the following regarding mortality and morbidity is false? Which of the following statements regarding CKD progression is not true?